Motorola Atrix launches in the UK | Android Blast! 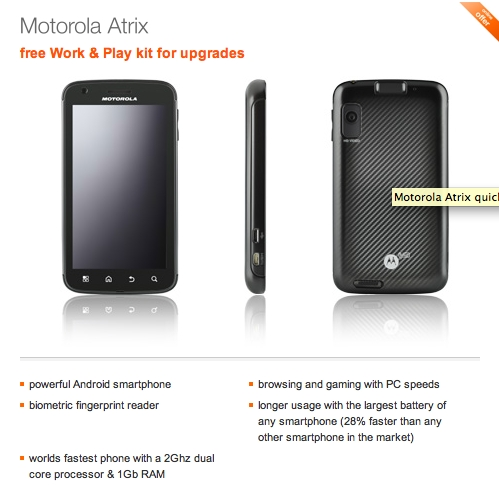 The Motorola Atrix dual-core Android phone has launched in the UK on the Orange network. Currently Orange is the only network in the UK offering the Atrix. Orange is offering the Atrix for free if you sign a 2-year contract for �35 per month. You'll get 600 minutes, unlimited SMS, 50 MMS and a 750MB of data. You can get a cheaper plan, but you'll have to shell out more for the phone. Orange will also sell you the laptop dock that goes with the phone, but that will set you back �299.99 (about $500 US).